A few weeks ago, my husband and I packed up our SUV and traveled from Arizona to Southern California for three days of family fun at Disneyland. It was particularly fantastic because Disney holidays are full of, well, magic. We used to live in San Diego and we were season ticket holders to Disneyland for a few of those years. While it seems we had it made (and really, we did), the one thing we were missing out on was experiencing Disneyland like actual tourists. We'd drive up for a few days here, a day there, but we never went for a full wait-in-every-line, meet-endless-characters, stay-until-the-park-closes-every-single-day kind of trip. Well, we finally did and it was well worth the tired feet. Visiting during Halloween made it particularly memorable. 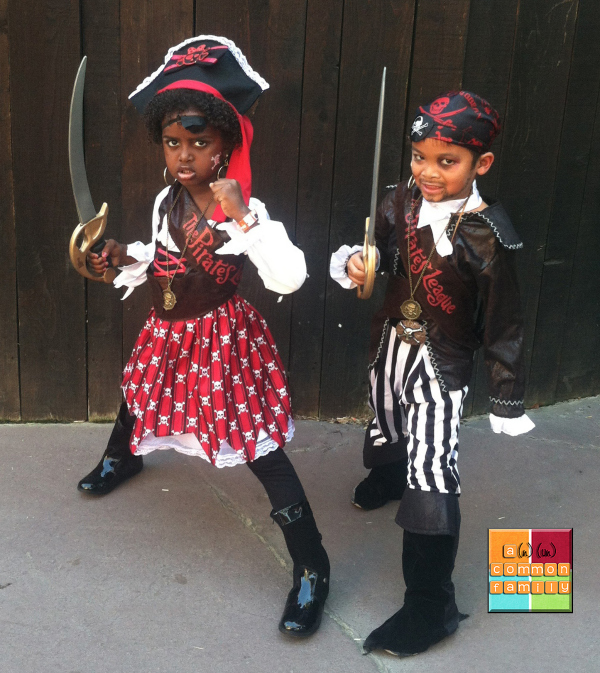 During the Halloween season, your kiddos can turn into real pirates. Or at least they can look like they've turned into real pirates. When I told my 5- and 6-year-olds about the Pirates League makeover and suggested pirate costumes for their Halloween experience at Disneyland, I didn't have to twist any arms. Children can choose from several options and prices range from $30 to $35. It took about 15 minutes each to turn my kids into "swashbuckling buccaneers." 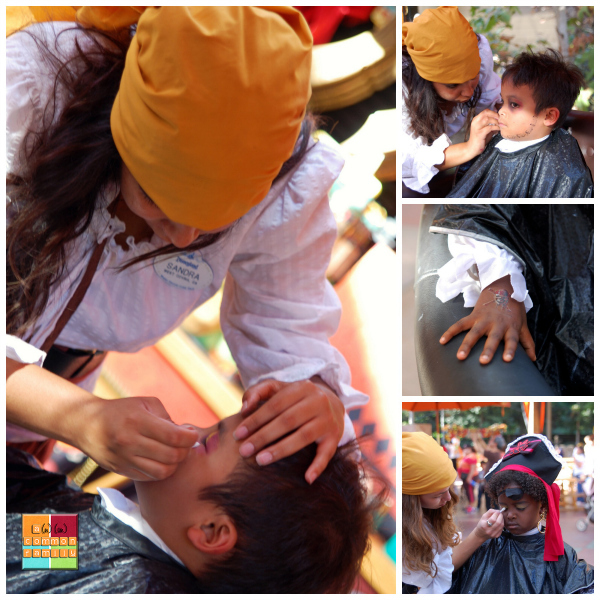 To complete the experience, they were given pirate names and had to repeat an oath at the end of the makeover. Serious stuff! Tip^ You should make reservations in advance, so be sure to call to schedule a time. 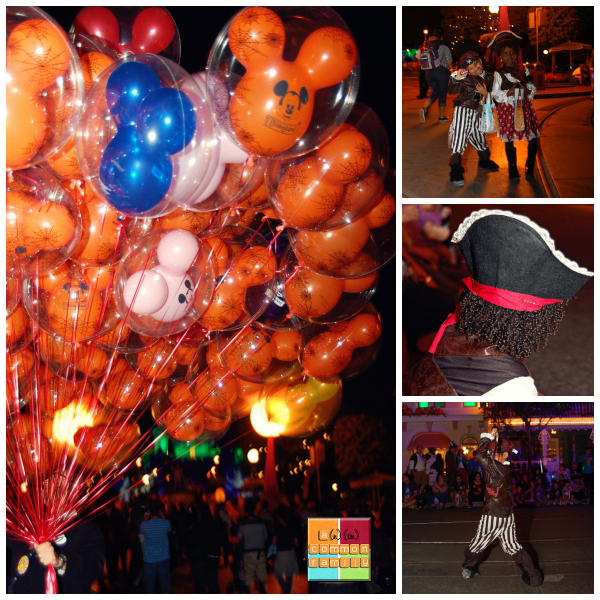 Part of the fun of visiting Disney during Halloween is Mickey's Halloween Party. This is a separate ticketed event at the park that's well worth the price of admission. I wrote more on the special Halloween event last week. Highlights include a Costume Party parade, where your favorite characters dress up for Halloween and sing and dance their way down Main Street, trick-or-treating, a fireworks show, the Monsters U dance party and more. All four of us loved the parade and my kids especially enjoyed trick-or-treating. That surprised me because we had to wait in line for the candy. The lines weren't too long, but still — who's patient when it comes to waiting for candy?! Apparently, the answer is two kids who are having a blast at Disneyland. Remaining dates this season^Tuesday, Oct. 8; Friday, Oct. 11; Tuesday, Oct. 15; Friday, Oct. 18; Monday, Oct. 21; Wednesday, Oct. 23; Friday, Oct. 25; Monday, Oct. 28; Wednesday, Oct. 30; and Thursday, Oct. 31. 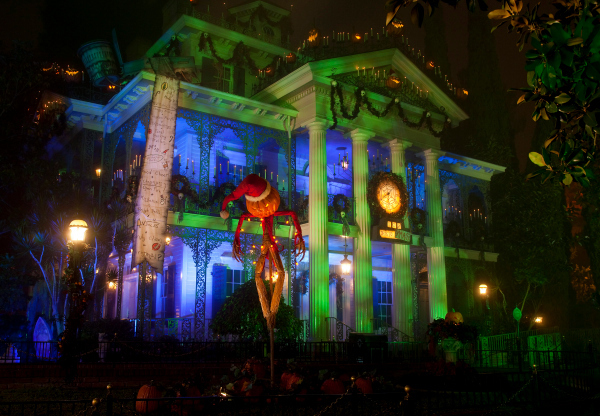 One of my favorite attractions during the holidays is the Haunted Mansion. I love it year-round, but during Halloween, it takes on a Nightmare Before Christmas theme, and that just so happens to be a favorite movie at our house. We also enjoyed the seasonal food at the park. One of our go-to restaurants, Carnation Cafe on Main Street, was offering a holiday special, the Jack Skellington burger — served on grilled sourdough with white cheddar, pepper jack, red onions and spicy burger sauce. My husband ordered it our first night there and my 6-year-old, who has become quite the foodie, pushed aside his kids' dish and instead ate half of the burger. Then he made us promise to return so he could order his own, which we did two days later. Did I mention that Starbucks just opened up on Main Street? The good news is that it's not seasonal... it's permanent. Mama doesn't just like her coffee; she needs her coffee. Somehow, the happiest place on earth got even happier. Beyond the holiday fun, Disneyland will always be Disneyland. It's fun and special for the whole family in a way few experiences are. My kids are at that perfect age — they're old enough to enjoy some of the best rides, but they're just young enough to find it all truly magical. They met countless characters, collected signatures, posed for pictures and gave meaningful hugs. And my heart filled up every time I saw their eyes sparkle and smiles spread across their faces. We made reservations for the character breakfast at Goofy's Kitchen, which was a highlight for all of us. Watching my kids wait with anticipation, guessing which character would visit next in between bites of fantastic food, was memorable. (Hey, it was great enough that I didn't even cringe when my daughter piled a hot dog on top of her waffles and French toast.) And just like every eating establishment at Disneyland, they were able to easily accommodate my gluten intolerance. After three long and fun-filled days, we woke up and faced reality: It was time to go home. Lucky for us, The Little Mermaid was released on DVD (for the first time in years) the day after we got home. My husband made an early morning run to pick it up. 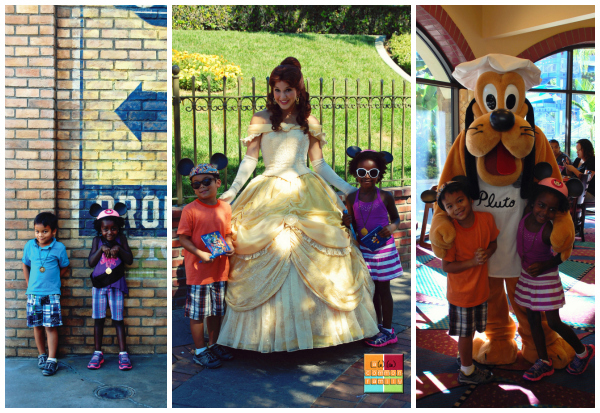 It helped ease everyone's post-Disneyland letdown — leaving is always so sad! Until next time, we have great memories... and hundreds of photos. I'm not a crafty mom. At all. But I was really proud of the Halloween costumes I pulled together for my kids. And while they required no crafting on my part (huge sigh of relief), I still think they looked unique and detailed. I bought them at Spirit Halloween, where I've purchased several costumes over the years. I had to drive to a few locations to get the costumes in the correct sizes because the particular ones we liked weren't online, but darn it, I did it. Sign up for email updates online. I received and used a 30 percent discount coupon on one of the costumes. While you're in the store, consider making a donation to the Spirit of Children program. I wrote about it last year, but in short, the program raises money and hosts Halloween parties in children's hospitals nationwide. My daughter's boots are by Bumbums & Baubles, a great children's shoe company founded by two moms who have been besties since they were 15. The one thing I learned last Halloween is that uncomfortable shoes, even for neighborhood trick-or-treating, can put a damper on the fun. Because we went stroller-free all over Disneyland with the kids in costume, comfy shoes were a must. 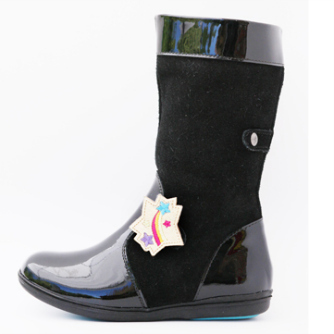 The Barrett Boots were a great fit (pun intended): They fit like a glove, they went perfectly with her outfit and she'll wear them all winter (and we can switch out the baubles! ).